I'm planning to use an iPhone 8 for a very long time, like till the end of the next decade. I've stocked up on Apple leather cases before they get discontinued, and purchased a wide variety of colors for review. I'll probably write another article on the iPhone 8 when I really have some spare time, but let's just assume that I'm going to use that device until the end of the 2020s. Apple (and most other manufacturers) discontinue their cases after some time, so I stocked up on the Apple leather cases. I really like leather as a material, so I ditched the silicon cases or cases made from any other material. To make things a bit more interesting, I've purchased each and every color I could get my hands on—even some discontinued iPhone 7 colors. There are a few exceptions, though. I've ignored Black and Soft Pink: Black because it's a boring color, and Soft Pink because the only things pink I buy are steaks (and very rarely stuff from Deutsche Telekom)! I also didn't purchase any case in Berry, Marigold, Marine Blue and Rose Gray. 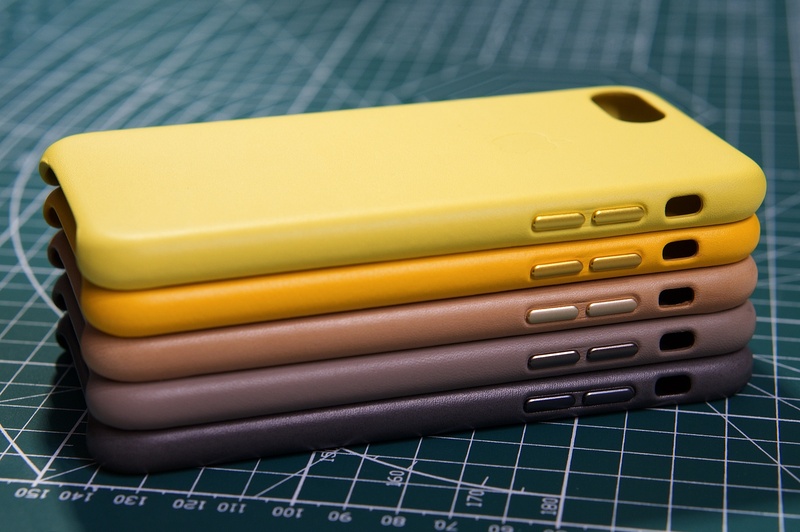 These colors were only used on cases for the iPhone 6 and 6s line—and they have a smaller camera cutout than is needed for the iPhone 7 and 8 series. In addition, Rose Gray is definately a color for the ladies out there. I really like Marigold and Marine Blue, though. 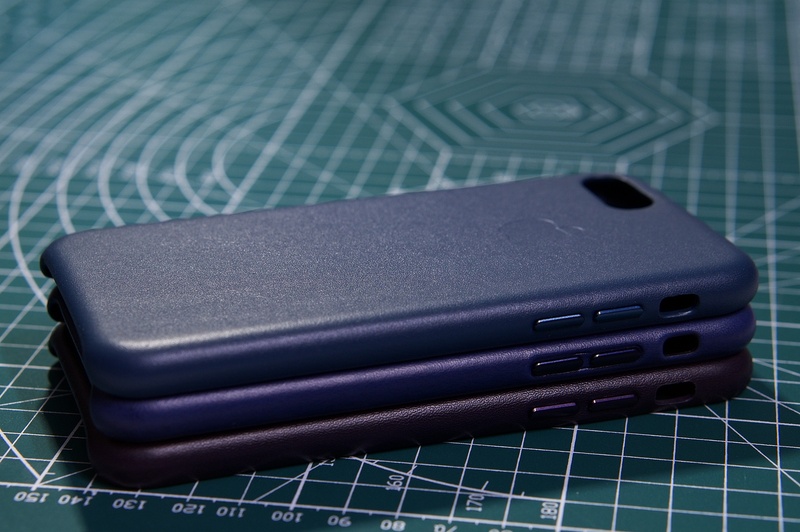 The last batch of colors that is not part of this review consists of colors that are only used on cases for the iPhone X and Xs line: Cape Cod Blue, Charcoal Gray (which looks a bit boring, just like Black), Forest Green, Lavender and Peony Pink. I really dig Forest Green and even more Cape Cod Blue, which looks like the nicest shade of all the blues Apple has ever put on a case. I sure hope there'll be a last line of new leather cases for the iPhone 8 this spring. If so, I'll probably make an update to this review. This leaves us with the following selection of 16 colors for leather cases: Bright Orange, Cosmos Blue, Dark Aubergine, Electric Blue, Geranium, Midnight Blue, Pink Fuchsia, Red, Saddle Brown, Sapphire, Sea Blue, Spring Yellow, Storm Gray, Sunflower, Tan and Taupe. Let's get into the details! 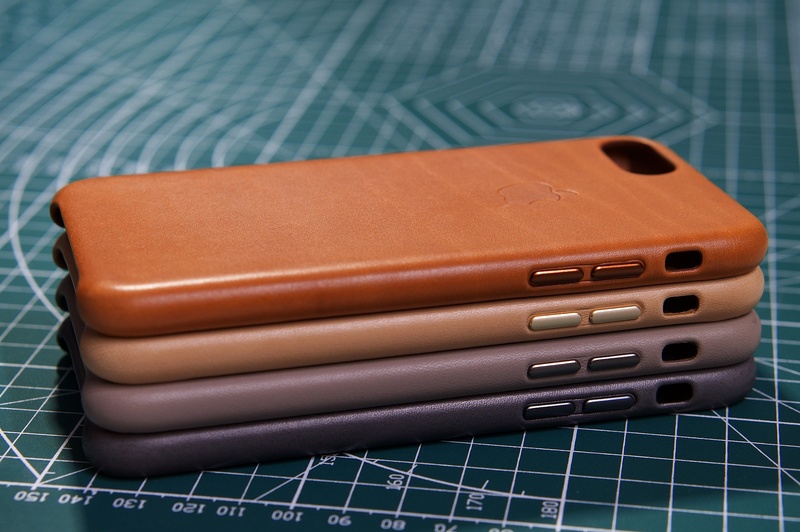 After all this preparation, what's my take on Apple's iPhone leather cases? The craftsmanship on all Apple leather cases is of the same high quality you'd expect. The inside of each case is made of microfiber fabric, to avoid any scratches from dust speckles trapped between the device and its case. There is a cutout for the actual mute switch. The volume and power buttons are covered by the case—more precisely, by metal buttons that feel exactly like their device counterparts. 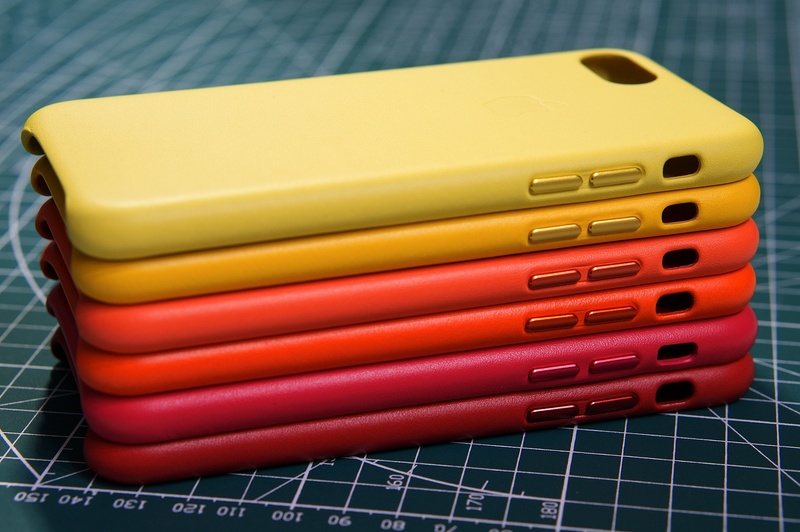 The leather of any case is very soft, evenly colored and without any natural defects. Be aware, though, that leather ages from use. Especially light cases will discolor over time—though in my opinion, that's part of natural leather's appeal. Spring Yellow and Sunflower: I really dig a certain hue of yellow. If you've ever lived in Germany, you know what I mean when I talk about “postgelb” or “postal yellow”. Sunflower is exactly that color, and I cannot wait to sport it during one future summer. Unfortunately, this color is retired and got replaced by the much more pale Spring Yellow. I do not like that hue at all, it looks faded from the sun and I fear it'll attract dirt and moisture much more. 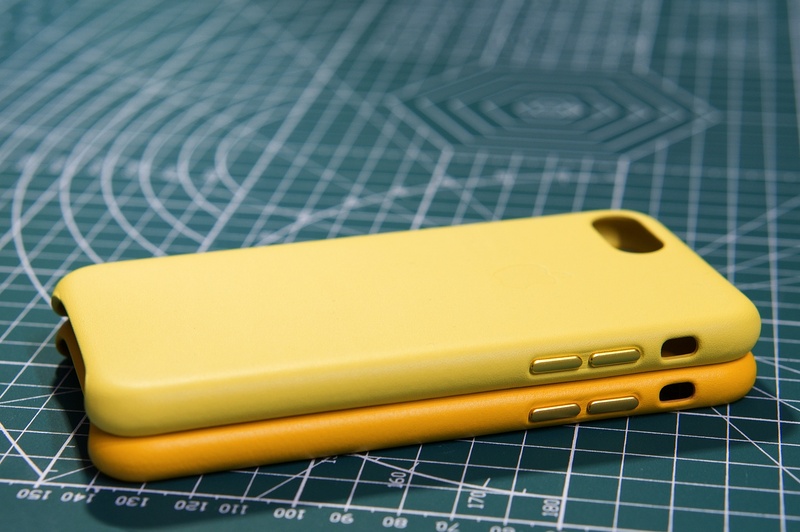 If you can get hold of a case in Sunflower and like yellows, i'd say go for this one! Geranium and Bright Orange: this is another very interesting color pair, with Bright Orange being the retired one. I am much more indifferent on these colors than I was on the yellows: Bright Orange is a maximally saturated color which will really flash and pop when you're using your iPhone. Geranium on the other hand is a bit more muted, but not nearly as faded as Spring Yellow. I think I like Geranium a tad more, though Bright Yellow is a perfect match for the corporate design of the university I'm teaching at. 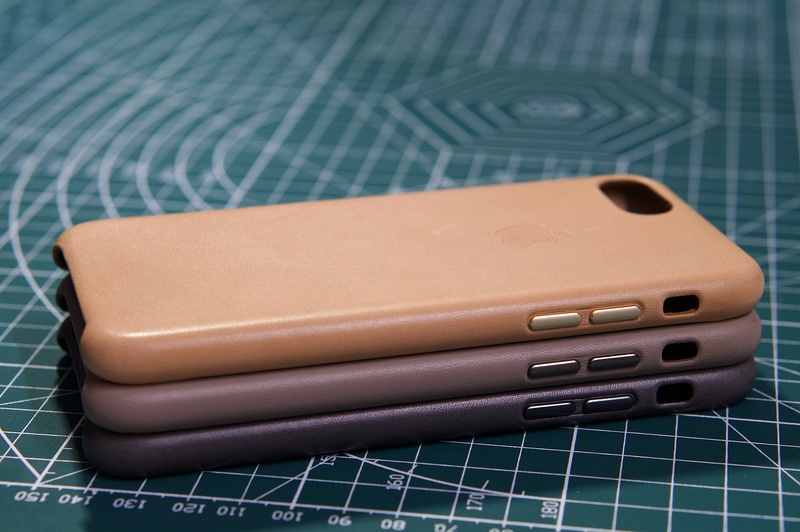 Saddle Brown: this one is a classic that Apple seems to keep in its lineup indefinately. And rightly so: it's the epitome of a cliché leather color. You cannot go wrong with this one—it's both a rich color and subdued enough for a professional environment. Tan, Taupe and Storm Gray: this leads us to the stack of “boring” colors. All three of them are suitable for a professional environment, though Tan (which is now discontinued) is best used by the millionaire's wife in your local neighborhood: a case in this color will probably attract grime and dirt similary to Spring Yellow. You won't notice that on a Storm Gray (or Black) case at all, with Taupe being a perfect blend of Tan and Storm Gray. I'm just happy I saved cash by not buying a Black case, which would be the fourth one on the “boring” stack. Pink Fuchsia: do you remember the only things pink I buy are steaks and occasionally stuff from Deutsche Telekom? I wish I acted by my own rules: Pink Fuchsia looked dark and acceptably purple on Apple's procduct photos, but it is in fact a very flashy lilac. If you're into girly stuff, I'd say go for a case in that color! I'm just happy I could sell mine on to a friend without much of a loss. Red: blue used to be my favorite color. I own tons of blue jeans, of course, but also lots of blue sweaters, shirts, and even my first car was blue. With a bit too much blue in my life, I made a careful switch to red a few years ago: my new car is red, and I own a red leather ottoman. 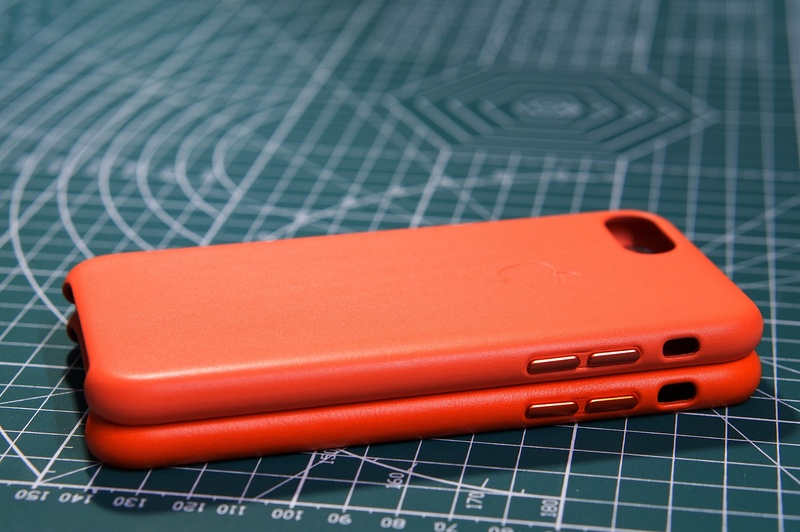 The Red leather case fits this style perfectly: it is a very dark and not at all flashy red. As a (PRODUCT)RED item, Apple will donate part of all sales to Aids research—another compelling argument for this great color. Sea Blue, Electric Blue and Sapphire: these are the blue cases that really pop. 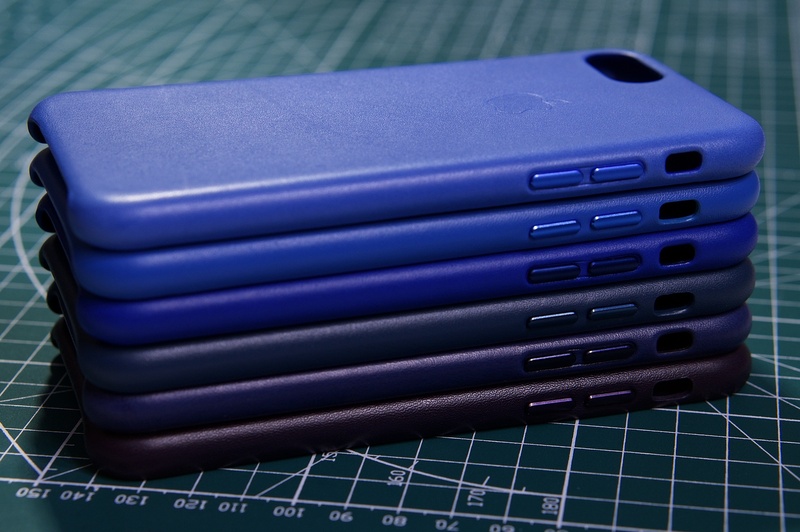 None of these colors are currently offered by Apple, with Electic Blue only discontinued recently. Electric Blue and the even older Sea Blue are very bright and saturated colors, whereas Sapphire is a very deep blue. My personal favorite is Sapphire, but only second to Cape Cod Blue (which is not available as an iPhone 8 case). If you like blue, you cannot go wrong with either of these colors. Cosmos Blue, Midnight Blue and Dark Aubergine: these three are the last colors to review—the darker blues. Midnight Blue is a very dark, almost black, shadow of blue. It is still available with Apple, and reminds me of the night sky in iOS' weather app. In contrast, the long discontinued Cosmos Blue is much more teal in hue, but almost equally dark. Dark Aubergine is a very dark lilac, though by far not as flashy as Pink Fuchsia. I'm not too keen on any of these colors, but if I had to pick one it'd be Cosmos Blue. I finished upgrading my iMac G3 that I got as a birthday gift—and it was much easier than expected! The A330-800 (the smaller A330neo variant) had its maiden flight from TLS a few days ago. Congratulations, Airbus! I've got an old iMac G3 as birthday present back in August, and it's now officially my side project to repair and upgrade this classic piece of technology before selling it on. On the first leg of worldwide route-proving flight test exercise, the new Airbus A330neo tours Portugal, Brazil and the United States in the livery of TAP Air Portugal, the first airline to operate the new jetliner. It's a quiet Sunday afternoon in July, and I'm in my favorite German (or Greek, for that matter) beer garden—the perfect time to finally write a report on my first trip to Asia back in February and March. The first Airbus BelugaXL has rolled out of the paintshop unveiling a special livery making it look like a Beluga Whale. The livery was one of six choices submitted to Airbus employees through a poll where 20000 people participated. With 40% votes in favour, the smiley livery won.